New to the clan? Here's what to do. » These forums are read only!! » I'd like to plan in a clan. » Anyone still playing BO2? At this point you should have already APPLIED for the clan as well as REGISTERED for the forums, you are ready to take the first steps in joining our community of gamers. 1.) Tell us about yourself in the Intro section. 4.) Take it upon yourself to send a few friend requests via your console to those people in your usergroup and those that welcomed you personally. When sending friend requests, remember to mention you're new to the clan. If your GamerTag varies from your forum name be sure to mention that. 5.) Fill out your profile. It needs to have your age, XBOX or PS3 ID. 6.) All new members are on a probationary status. To become a full member and get added to an Elite or Ghosts clan roster, you need to make 10 posts on the forums. So be active and get to know the other members of the clan. 8.) NETWORK! We realize it may not be convenient to visit the forum. 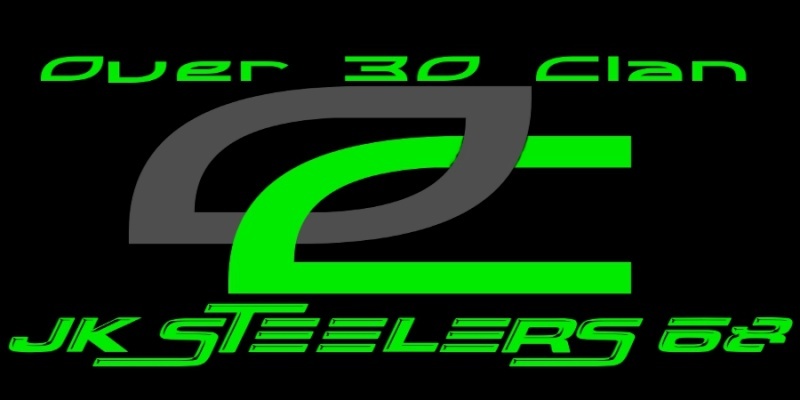 Follow @Over30ClanUSA on Twitter. Many members have twitter links in their forum signatures - look them up. First, here are some general Forum administration things to do. - We don't require forum participation outside the 10 starting posts, but we do encourage it. It's the easiest way to get to know members of the clan that are already here, and is a way to get your own name out there so we know who is active and who isn't. That makes it easier when accepting friends requests and getting parties together. - Post a new thread in the Introduction section, introducing yourself (duh). This will help you meet a few people on get in with the more active players and gamers. Feel free to mention whatever you want; nothing is required, but it's always nice to know a little bit about our fellow clan members. Current location, alma mater, favorite sports teams, family and pets. There are all things you can talk about. Oh, and be sure to say what console you are on. Intro section can be found here: Intro section. - When you first join, you will be a probationary member. All you need to do to become a full-fledged member is post 10 times. Your Intro post will be (most likely) your first post. Feel free to jump into conversations, or start a new thread asking a question. Being active in the forums lets people know that you want to be here, and increases the chances of getting picked up for games since more people will know that you are active in the community. - You may also notice that your name will be colored yellow. This signifies a new member. You can go to the usergroups menu (at the top of the page, or here Usergroup(s)) and join the groups that apply to you. This does 2 things, lets everyone know what console you are on, and what division you are from. Once you have made the mandatory 10 posts, your name will change to the appropriate color for your usergroup. There are a few other groups as well, based on game and a few special ones for you to discover! - Contrary to what many may think, we do actually have some rules. You can read them here: Forum Rules. They are the general be respectful, play nice type of rules, but at least give it a once over. - At the bottom of the main page you can find the color coded guide. From the usergroup menu you can also see who is in your division and pick some names to add online. - It is easier to add friends while in lobby, so take advantage of when you meet up in a lobby and add everyone you can there. If you are not sure who is in the clan, speak up and ask. Pick a few people that are regular posters on here, they are also frequent players. Send invites to people that replied to your Intro post, as they are most likely frequent players. Look for people in a division that matches your gaming times. 7-10 pm is the most popular gaming time, for most people. But if you play at 11 EST you may want to look for more central members. Put x30x or Over 30 Clan in the Friend Request so we know you're from here. - Feel free to join any lobby any time. Look for people in a party first. Jump on in. Send a PSN message to ask to get invited to the party. As long as there is less than 6 in the lobby, you're good. If you're the 7th man, check to see if GroundWar is an option. Everyone is very friendly but GW can be a awful experience at times. So do not take it personal if GW is not what anyone wants to play. But we will run GW with new guys to give everyone a chance to play together. - If you cannot find a group in a party, look for members playing the same game and try join. This can take multiple tries. But we make people rage quit regularly, so there is often a spot open in game. You may be put on the opposite team, just play thru and then in the pre-game lobby ask if there is room for you to join the party. - Other methods of getting into a party.. Send a PSN msg asking "full?" "got room?" etc.. Send invites, this implies that you are looking to party up. If people are in are in a party with an opening they will invite you to join them. - If you join a private match, check to make sure what the rules might be. And whether it's a clan scrim before just blasting away at anything that moves. - I assume most of the above applies, but as I understand it, XBOX has a much easier method of adding friends. There is a roll call thread (linked below), from what I understand you can copy and paste that list to your live.com page and add them all. - XBOX also has a dumby GT over30clan x30x with only 30s on it. Add any members and F/R it to add yourself to the list. - An important thing to remember while in a COD lobby you can press Y to bring up an in-game friends list, you can then press RB or LB to cycle thru lists, one of which is the CLAN list. The clan list will display all the members of your respective XBOX roster and their online status. This is a great way to quickly find people to play with while your friends list grows. For all of the new members! Please read the beginning of this post. It will help you a lot. Also please identify yourself in your F/R. It is impossible to manage the 30s from the non30s if you don't identify yourself. So please include new to the 30 or something like this along with your F/R. If you are in the lobby then just speak to the members that you are wanting to friend. Many 30s might not know you are a member especially if you are from the second roster. We have been taking over lobbies, but you have to understand that some randoms jump in know and then. Yes make sure that you include 30, or x30x, or something in your FR so that it will be accepted. Having trouble making friends? press triangle (PS3) between matches and right d-pad till the header reads your clan. This will show clan mates online and what game they are in. press X and try to join the game. Make sure you elite clan tag is up. This will let all >30's know you are in the clan looking for a group. They will either pick you up or let you know they are full. It takes i bit to get into a game sometimes. I play solo and try to get in a group between matches. i found that after the 1st few friends i made. it was easier to get into a group of 6, play a few rounds and when we backed out, send the f/r to non friends then, they can see you in the party. people wanting in one of the elite clans need to have the free elite on pc atleast for mw3 ! This is not an introduction thread.... all new members should post a new thread introducing themselves in the Introductions section of the forums. The word in green is a link that you can use to find the section much faster. Once there, near the top of the page there will be a little button that says "New Topic," if you click on that it will open a new thread on the forum. This is where you introduce yourself to your new clan mates. Include information such as age, location, gaming system used, gamertag/psn name, main game type you play... maybe a little bit about yourself. This is probably the fastest way to get people to notice you. Easiest way to meet people is to post in the forum and keep posting. This helps people recognize your gamertag when you send out a friend request or jump into a game. Im On Season 4 of Breaking Bad right now(I have already watched them all, but i went back and started watching the all over again). Locking this as it's just an announcement. If you are new to the clan, click here! Subject: Re: New to the clan? Here's what to do.